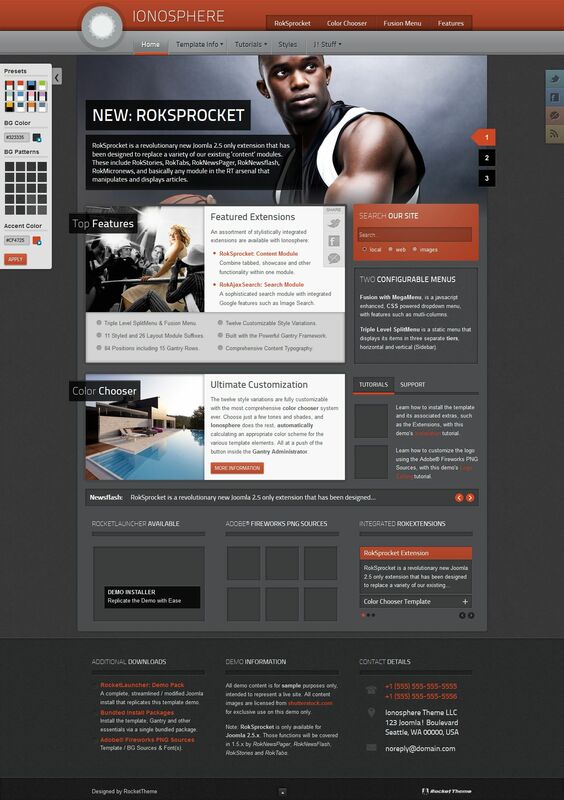 RT Ionosphere - March professional template from the popular design studio RocketTheme. This template has a huge thanks to the integrated functional universal toolbar Color Chooser, which offers a fast set color scheme of the template. In the new template developers introduced a new module RokSprocket, which was designed to replace a variety of existing modules display content in various forms. It includes the following capabilities club extensions: RokStories, RokTabs, RokNewsPager, RokNewsflash, RokMicronews and further planned integration with third-party components K2 and ZOO. RokSprocket is a very powerful and full-featured extension display content with a very user friendly interface and configuration support only Joomla 2.5.